Headlines are filled every day with new, radical applications for the rapidly advancing 3D printer phenomenon. 3D-printed prototypes for developmental models have been around for a few years now, but the paradigm is chancing to include finished products. Just as you can send a file for a printed circuit board that you design to a vendor for rapid turn-around fabrication, you can now ship a 3D CAD file to companies that will print your object. 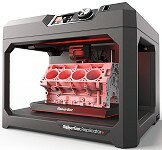 Capability has increased while prices have decreased on 3D printers over the past couple years. This page contains information on companies that provide products and/or services for 3D printing. 3D Insider is all about giving you the tools and information to create whatever your heart desires with a 3D printer. If you are looking to make a full time career out of 3D printing or you are just looking for a new hobby, 3D Insider has it all for you. 3D printing has been growing at a tremendous pace and we love working in such a fast-paced industry. A rapid prototyping solutions and manufacturing services bureau providing additive manufacturing solutions for design and engineering needs. Global provider of 3D content-to-print solutions including personal, professional and production 3D printers, integrated print materials and on-demand custom parts services for professionals and consumers alike. Provider of an affordable, durable, easy to use 3D printer ideally suited for engineers, hobbyists and students alike, allowing one to explore their inner creativity to an extent not previously thought possible. Specializes in FDM (fusion deposition modeling) ABS plastic prototypes. Offers 3D printing, rapid prototyping, virtual prototyping and 3D CAD services. Developers of a high quality, low cost 3D printer that enables designers and engineers to create 3D forms with the touch of a button. Print your images and bring your favourite memories to life. An online 3D printing service. We are a production house for designers who create products for 3D printing. Uses the state of the art technology developed for its VIVID & RANGE series of 3D scanners to guarantee the best possible result for your project no matter the scope. Manufacturer of desktop 3D printers for making professional quality models. Offering 3D printing of your parts and prototypes using our PolyJet™& printing equipment, along with other technologies from our partners. Creation and exchange of downloadable products including software platform to make downloadable products, online laser-cutting services, online 3D printing services, and online CNC routing services. Manufacturer of the Portabee, a simple and effective 3D printer. Dimension FDM 3D printers for all of your needs! Our product portfolio provides access to processes such as rapid prototyping, 3D printing, 3D laser scanning, and 3D CAD design. Provider of 3D printing services using Polyjet 3D printing. Manufacturers of RoBo 3D Printers. Offers a fast 3D printing service. We start from your 3D design to manufacture a specific object: interior decoration, figurines, robots, miniatures, scale models. 3D Printing marketplace and community. On Shapeways, individuals can make, buy and sell their own products. Manufactures 3D printers and materials that create prototypes and manufactured goods directly from 3D CAD files or other 3D content. The company’s 3D printers are based on patented FDM® and PolyJet® technologies. Manufactures the Ultimaker 3D printer, designed to print larger objects, while the printer only occupies a small space on your desktop.